BILLINGS, Mont. 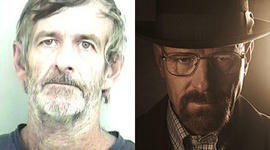 - Walter White, a Lockwood man who coincidentally has the same name as the lead character in the AMC television series “Breaking Bad,” has been sentenced to more than 12 years in federal prison for dealing methamphetamine. U.S. District Judge Donald Molloy sentenced White on Monday to nine years for possession of meth for distribution followed by three-and-a-half years on weapons charges, according to The Billings Gazette. Molloy held White responsible for the distribution of 32 and-a-half pounds of meth, a quantity he called "extraordinary." "He ended up getting shot by his son," Molloy said. "Thirty two-and-a-half pounds of methamphetamine coupled with guns and violence is as about as serious as you can get." White's son, Brandon White, is charged with assault with a weapon and jailed on $150,000 bond. Court records say Brandon White told investigators he shot his father in the back in January during an argument over a $10,000 drug debt. White was arrested in March after law enforcement officers investigating the shooting searched his residence and found four ounces of meth, valued at about $10,000, two handguns and more than $15,000 in cash.